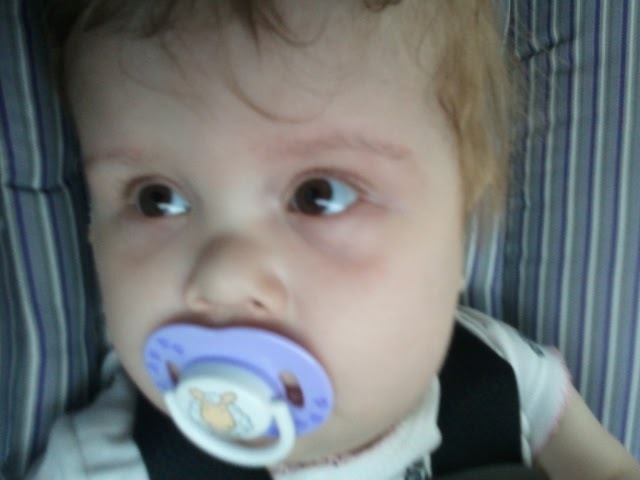 This was our SIXTH time coming home from a hospital admission. 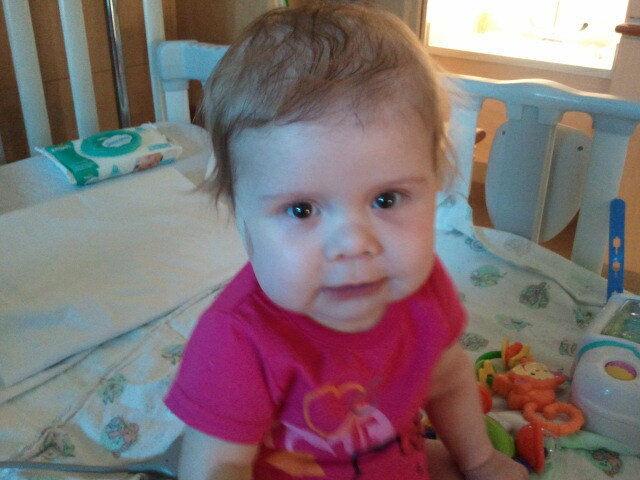 Added another 4 days to her “# of days in the hospital” to clock a total of 338 days now. Mommy’s thoughts: At first, I was a little irritated. Let’s not “assume” Annabelle will be visiting the hospital again soon! I’m a “think positive” kinda Momma! It’s probably why I waited so long to take her in, cajoled the doctors on the phone to letting us try pedialite a little longer. That won’t happen again, I can promise you that! Annabelle does NOT need to suffer due to my stubbornness! That said, oh my. It is SO SO SO SO SO SO SO nice to have my daughter home! She LOVED seeing her Daddy and sisters again. Since we’d all had a bug, they had stayed away from the hospital and hadn’t seen her since Saturday morning. Annabelle was quickly laughing at her big sisters and playing with all her toys. She was give out though and fell asleep early. And she handled her feeds okay here, so I’m SO thankful for that! Where is Annabelle?? In her carseat! HOMEWARD BOUND! But she’s not technically getting enough calories to “grow” so we can’t stay like we are for very long. The thought is it will take her belly a few days to get used to digesting food again, and we can work our way back up to full calories and then try again to switch to the other formula in a few weeks. That might sound REALLY dumb, but my long-term goal is to obviously for her to eat normal, which means that she could drink normal milk. If we have to go “that” far from normal food, it’s just much farther we will be from getting back to normal food. Some might not agree with me in that logic. And if she doesn’t handle more “normal” formula soon, I’ll agree to go to the completely medical formula. Oh, and we did NOT have the swallow study. In the end, we didn’t want anything to potentially prevent us from going home today, so we are keeping it scheduled for Monday. BUT! The WONDERFUL speech therapist did get the time changed from 8:30 to 11:30 so we just have to go right before clinic instead of almost 4 hours early! This will help a BUNCH! Thanks SO SO much for your prayers the last few days! We appreciated them SO very much! Oh my goodness! She is so big! And precious. Glad that she's home again. Sweet, sweet miracle baby! Two of the other blogs that I follow ( http://patriceandmattwilliams.blogspot.com/ , and http://owensheart.com/ ) each have kids with G-Tubes. One of them is also a HLHS, and the other is a completely different disorder. None-the-less … they each had horrid problems tolerating formula feeds after some time. By doing a blended diet through the G-Tube, they were both able to not only tolerate feeds once again and stop puking, they were able to get more than enough calories to grow! I'm sure if you contact the Moms of the blogs – they would be more than happy to share – they've each done more than a few posts regarding the blended diet through the G-Tube! So happy that Annabelle is back home where she belongs, and hope that you find a solution to the pukes soon – I'm sure that they are no fun for anybody! NICU nurse up in Chicago! I actually was going to post just was jess said. A blended diet would probably work really well for little miss not to mention getting whole foods and nutrients!! Formula has so much sugar 🙁 Owens mom got a vita mix blender and is a wealth of knowledge and I am sure would be happy to answer any questions. Owen didn't eat for a while but now is! i also feel like a huge nerd for knowing exactly what new seat you got her because i have the same one!! it is a great seat and will last a long time especially if you are rear facing past two! Ditto on the blended diet. This can keep you from elemental formula and also it can be as thick as you need it to be to help with reflux. Start with just adding baby food just like you would an oral feeder. Often kids on a blended diet can tolerate milk even if they could not tolerate formula and there are other options besides cow milk: goat milk, soy milk, rice milk, etc. Sometimes the milk is not the culprit to the intolerance. It could be the high sugar content or the corn or just the fact that it's unnatural to the body. If you're interested you can get started with a basic blender, but if you contact the two companies: Blendtec and Vitamix one of them may donate a blender to you. Thanks for the diet tips! It is one of the ideas I've been tossing around. I think I'm going to try it in little bitty stages to see how it works, and work up to it. Talked to the dietitian at the hospital about it while I was there, and she gave some suggestions about it, but wasn't too sure about the "complete" blended diet thing. Even when gagging and vomiting, Annabelle was "growing" just fine on her formula (but now that we are down to the lower calorie, we DO need to get higher) it's just her discomfort that really hurts my heart to see. Anyway, thanks for the suggestions! I'm researching! So glad to hear she is home! And what a little doll she is! Can't believe how big she's getting. Praying for you and your gang. Glad you're back home, Krista! And I agree with the others…Something about those pictures has her looking so much more grown-up! So adorable. Is Annabelle off of the nasal cannula? I didn't see it in any of her pictures. Just curious! So so happy you're all home again! Annabelle looks awesome!! Ashley… YES!!!! Well, during the day anyway. We are still putting her on at night, just on 50ccs though as when she's deep asleep, she dips to mid80's sometimes. That is one GOOD thing that came out of her hospital stay. They can monitor oxygen MUCH more accurately than our machine at home does, so we were able to get her OFF of it during the day completely! She's been off during the day for the last 3 days! "Annabelle is our ____ month old infant with history of _____"
"Annabelle is our 13 month old TODDLER with history…. " 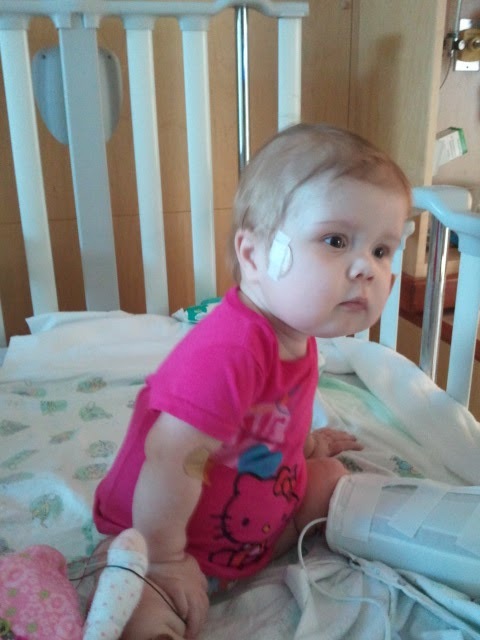 Annabelle looks SO cute without her nasal cannula! She's always a cutie, but now you can really see her face. You must love it! Glad to hear you guys are back home! I'm glad Annabelle is home again and doing well. It's wonderful to see pics of her looking so healthy. I'm thrilled that she's breathing on her own. So many praises today. Love that! So happy to hear your household is back together again.Praying for those feeds to get better! Please pray for my great nephew* Cayden (long medical story) same baby, just a diff name..He's* got a tough road ahead also and needs a ton of prayer! Lis, will be praying for Cayden! !